Care for the environment is important to us and our mission which is why we encourage sustainable practices like recycling clothes and household items. Sales from the Op Shops provide meals, showers, staff and continuing programs at Norman Andrews House. Thanks to our generous community, Chapel by the Sea receives a tonne of donations, so much that both our Op Shops are overflowing with goodies. We are currently working on getting excess supplies sent to Tanami Desert, Alice Springs and Arnhem Land to allow locals to set up their own Op Shop. 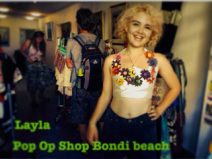 The North Bondi Op Shop specialises in clothes, shoes, accessories, books, CDs, DVDs and household items. The Pop Op Shop at the Chapel has a fabulous selection of clothes - Etienne our Saturday manager has been very successful in choosing clothes that our visiting shoppers love. Drop in and pick up a great bargain. We are also happy to pick up local donations if you feel like having a clean out. Our stylish designer clothes and accessories are either donated to us or plucked from the donation bins and sold in the Chapel lobby from Wednesday to Saturday to tempt beach goers to don a sombrero, or a summer dress, or grab a boogie board on their way to the waves.